My grandparents stumbled on some cheap Heinz Apple Cider Vinegar while cleaning their house. Ingredients: Made from the juice of apples diluted with water to a uniform pickling and table strength of 5% (50 grains) acidity. Barring the origin and 1% difference in acidity, how does it differ from Heinz® All Natural Cleaning Vinegar? Is Apple Cider Vinegar equally as potent for cleaning clothes and the house? Ingredients: Made from select sun-ripened grain, diluted with water to a special cleaning strength of 6% acidity. Beverly Leestma purports that the brand beneath at Walmart didn't indicate "the acidity but did state it was “Not For Food Consumption." Some vinegars (like this Industrial Strength Cleaning Vinegar) are still 5% but aren’t refined or purified to be food quality." Assuming that the industrial strength cleaning vinegar's acidity is also 5%, then why can't it be consumed? Why must raw vinegar be refined or purified for human consumption? Is Beverly Leestma correct in her wariness beneath? Part of me thinks Heinz is just looking to get in on the popularity of homemakers who want natural cleaning. I’m not convinced that the 1% of extra acidity warrants the higher price tag and that maybe they’re just trying to cash in on a trend at our expense. 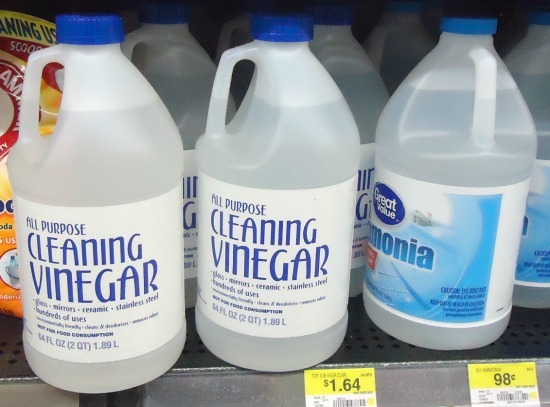 The acetic acid in "Cleaning vinegar" may come from an industrial process. One way to produce acetic acid industrially, is carbonylation of methanol. And methanol is toxic! So unless the product has been analyzed for residues of methanol and approved for food consumption, it is probably unwise to use it for consumption. What happens during cleaning silverware? What reaction occurs when soaking a piece of meat in apple cider vinegar?